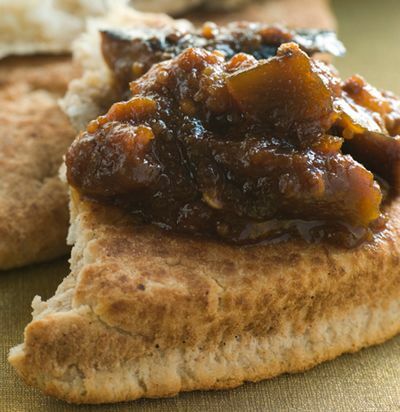 Chutney is a sweet and sour condiment that is made from fruit, sugar, vinegar and spices. It makes a versatile gift in a jar because chutney can be served very simply – as a tasty side addition to crackers and cheese, for instance, or used as a flavorful condiment to dress up a formal dinner. This particular recipe reminds me somewhat of Branston pickles and I enjoy it very much as part of a traditional Ploughman’s Lunch, with sharp cheddar cheese, a slice of Brie, English Pickled Onions, pickled beets, a boiled egg, slices of tart apple and, preferably, a nice hunk of Melton Mowbray pork pie and a chunk of fresh bread. Mmmm-mmm! 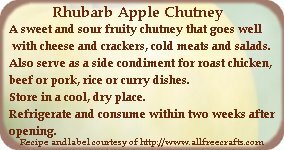 Chutney is often made and served fresh, but also makes a wonderful smooth or chunky preserve that goes well beside rice, curry, casseroles, roast chicken or beef, or cold meats. Once opened, chutney should be refrigerated and consumed within a few weeks, so smaller canning jars are best if you only cooking for one or two people. Decorate the jar lid with a circle of fabric and tie with raffia or ribbon. Use the free printable chutney label shown above, right, to dress up the jar a little more and provide directions for using and storing this condiment. This recipe should make about 4 to 5 cups. Combine rhubarb, apples and sugar in stainless steel or enamel saucepan. Let stand one hour. Add remaining ingredients and bring to a boil. Reduce heat and simmer until thick, about one hour, stirring frequently. Ladle chutney into sterilized jars leaving about 1/8 inch of head space. Seal, cool and label, then store in a cool, dry place. Refrigerate after opening and consume within two weeks.